With the release of my latest young adult novel, Jamhuri, Njambi, & Fighting Zombies (the second novel I've written from the point of view of protagonists of color) I wanted to share here the Author's Note I've opened JN&FZ with which I wrote as an attempt to enter into dialogue with some of these challenging and complex issues. I definitely would never suggest I have all the answers on this, but I think the best we can do is to keep a dialogue going on it. Scroll down past the cover for the full essay. I have not stayed in my lane, and my sense of social justice—not to mention my friends who identify as people of color—have called me out for it. Rightly so. It is, I hope, but it’s other things too—things that must be viewed in the context of colonialism and the social, political, economic, and military oppression of people of color. First of all, I’m no trailblazer. Other writers, such as Nnedi Okorafor and N.K. Jemisin, have been producing works that fuse sci-fi and fantasy with African themes for some time. Before them, Octavia Butler was doing the same. Acknowledging, celebrating, and profiting from a white male’s derivations from the art and images of people of color over those artists of color who have a more personal, historical claim is nothing new. It’s a long tradition, characterizing the careers of artists as diverse as Al Jolson, Elvis Presley, The Rolling Stones, Robin Thicke, Justin Timberlake, and so many others. So, depending on the interpretation, Jamhuri, Njambi & Fighting Zombies is a celebration, an acknowledgement, or it’s just another form of exploitation and cultural (mis)appropriation. Truth is, it’s all these things. This invention called whiteness uses and abuses us . . . extracting our culture, our dollars, our entertainment like oil—black gold—ghettoizing and demeaning our creations and stealing them, gentrifying our genius and then trying us on like costumes before discarding our bodies like rinds of strange fruit. There is nothing to add to Mr. William’s words. They are complete, powerful, and persuasive on their own. There is a counter argument. It goes something like this: that the cross-fertilization of cultures has always taken place and led to benefits in a variety of disciplines. The very characters these words are written with are “Roman,” influenced by Greek and Phoenician alphabets; the numbers in this text are “Arabic,” although really first codified by a Persian scholar (Muhammad al-Khwarizmi) who modeled them after a number system used by Hindu mathematicians. The precedents for cultural exchange in fantasy literature are many fold. Take J.R.R. Tolkien, who borrowed heavily from Norse, Finnish, Germanic, as well as his own Anglo-Saxon traditions. Such fusions can create works of profound beauty and stand testament to the value of cultural diffusion. And it is often artists who are pioneers in reaching across cultural and social barriers, drawn by the universal experience of art and the appreciation of beauty. In the process we may blend influences, foster collaboration, and forge lifelong friendships despite ethnic, racial, or other social barriers. Sometimes amazing art is produced too. But it is equally important to point out that Tolkien’s ancestors did not systematically oppress these other groups. Furthermore, Tolkien, in his own time, did not benefit disproportionately from historic or current oppression of Scandinavians or Germanic people in a way that denied these groups equal opportunity to flourish. The exchange of trade, ideas, and even violence among these peoples took place (more or less) among groups with equivalent levels of power—on an even playing field, if you will. The costs and benefits were equally shared. No such moral or ethical neutrality can be ascribed to the exploitation of people of color by Europeans or their white descendants. White privilege is real. It has benefited me and still benefits me as a white man, a white writer, in the United States. There is no getting around this. But just because something looks like an unethical pattern in the past, does not mean it is the exact same thing today. 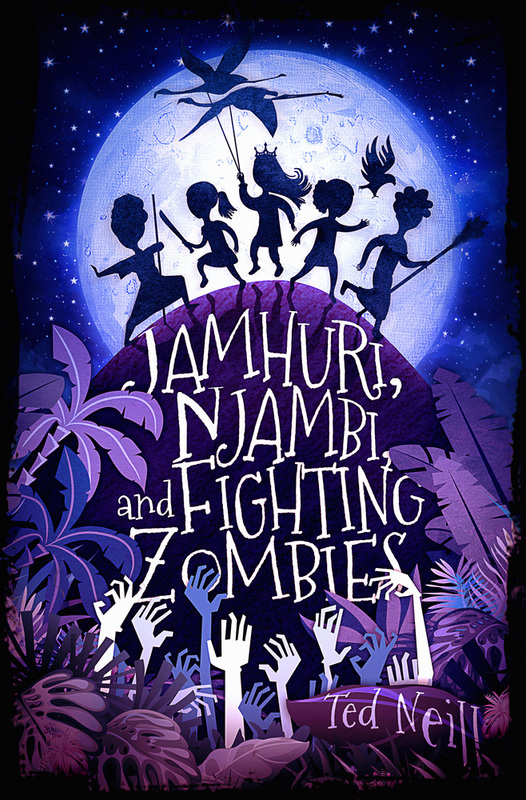 In my heart of hearts, I would hope that Jamhuri, Njambi & Fighting Zombies is not exploitive. But intentions do not exculpate the artist. The art and work will stand for themselves and will rise or fall on the interpretation, opinions, the praise or condemnation, of others. I expect both and I have no answer other than my work. So why write Jamhuri, Njambi & Fighting Zombies? Can we escape these patterns of oppression, exploitation, and historical amnesia? Those who are not seized by the urge to create, to channel some idea from the world of the imagined to the real, might not understand the fierce insistence of an idea, a plot, or characters and their stories knocking around in an author’s head. Like the Greek muses, these imagined personalities and events seem to exist outside us, using the artist as a mere channel. Michelangelo described it best when he said the figures he sculpted had always already existed, trapped inside their blocks of marble. It was simply his role to chip away the excess to reveal them. It is the same with the characters and stories that reside in a writer’s head. They feel, to us, as if they already do and have always existed—a bit like a law in physics, a pattern in number theory, or an undiscovered prime. We as artists reveal; we create, because we can’t not. These characters, Jamhuri, Njambi, Latia, Anastasia, Esmeralda, and their stories, although not completely aligned with my own background, wanted to be out in the world. They wouldn’t leave me alone until they were. The second reason was a personal promise. These stories were conceived in the early 2000s when I was living and working at an orphanage for HIV+ children in Nairobi, Kenya. At the time our resources for books were limited. Although we benefited from donations, the books I read to the kids had few characters that looked like them. As much as they enjoyed Dav Pilkey’s Captain Underpants (which did include a main character of color), they clamored for more characters that looked like them, characters from backgrounds and contexts they could relate to. As children who had been abandoned, abused, stigmatized, and generally not “seen” as individuals outside of their HIV status, this broke my heart. At the time, writers such as Nnedi Okorafor and N.K. Jemisin were not on my own radar. So I set out to write a few stories of my own. As a result, Jamhuri, Njambi & Fighting Zombies is laden with that personal history and meaning for me. If these stories never find an audience beyond the children I wrote them for, then I am at peace with that. The audience and stories deserve at least that much, if nothing else. But this all begs the question of whether a privileged, white, male writer can or even should write from the point of view of characters of color. The answer leads me to my third and final reason for writing and publishing these stories. “Can a privileged, white, male writer write from the point of view of characters of color?” I will leave that for the readers to determine. I’d like to think these characters are authentic and well developed, but sales, comment sections, and reviews will bear that out as true or not. The question of should I have even tried to write in the point of view of these characters also looms large for me. I, for one, believe that art can transcend race (in some ways). As mentioned above, the common ground, the shared experience of being an artist, has united people from various backgrounds for the entire story of humankind. Moving from literature to music, I landed on the career and life of Benny Goodman as an example. Contemporary critics may be split over the legacy of figures such as Goodman, whose classical background and European ancestry “legitimized” jazz for white listeners, making jazz “safe” to bring into venues such as Carnegie Hall. His integration and promotion of this African American art form in his own performances undeniably contributed to his own stardom and the success of his career at a time when black musicians couldn’t drink from the same water fountains, much less perform in the same concert halls as he. So in that sense, perhaps Goodman’s choices were exploitive. But Goodman also launched the careers of many African American jazz artists and, during a time of racial segregation, defiantly toured the US in an integrated jazz band. And that still does not answer the question of whether a white person can even write believable black characters? It is not as straight forward as I once thought. For instance, my friends—writers of color in literature, television, and film—have had to write white characters throughout the course of their careers. It’s the reality of whiteness being associated with the mainstream, with “normality.” This is a consequence of our ridiculous default culture of white-centeredness and the unfortunate reality of the marketplace. The question of whether or not my friends of color “can” write white characters rarely comes up for them. After all, as people of color in the United States, they are bombarded with images of whiteness. They are forced (sadly) to move in a sea of pallor that is, arbitrarily, considered “the norm.” As people of color in a predominantly white society, they have to understand white culture—even better than we might understand ourselves (as James Baldwin once pointed out). Baldwin has written that people of color are forced to “get” us whites, to understand us. Sometimes reading white people, living in a state of double consciousness (knowing yourself but also imagining how others misperceive your identity), is a matter of life or death. The tragic deaths of Philando Castile, Eric Garner, Alton Sterling, Charleena Lyles, and the murder of so many other black citizens by police can attest to this. But to say that whites cannot do the same, that a white writer cannot and should not write from the point of view of black characters (as I have been told) is a conclusion I am unwilling to accept. Such a conclusion is flawed; it posits that we whites can never understand, much less endorse, the perspective of anyone but ourselves, even with effort, intentionality, and exposure. If this were true, it leaves me without hope. If understanding could only go in one direction: people of color learning to interpret and live with white people who are unable to do the same, progress would be impossible. It may take intentionality and no small amount of effort, humility, and discomfort, but I want—I need—to believe that members of a group of people who have been oppressors and a (rapidly diminishing) majority can come to understand and endorse, to love and accept the perspective of an oppressed minority. Perhaps it is the part of writers and artists, who try to see out of the eyes of others, to play a constructive role here. Again, to say otherwise—that artists, or even people in general, cannot do so—would be to suggest that people of color alone have this ability and whites do not. This seems like an overgeneralization, a dangerous assumption—in short, pure fallacy. So yes, I believe that a white, privileged writer can and even should try to write from the perspective of others—with care, humility, and historical sensitivity. Must we be aware of harmful cultural legacies? Absolutely. We should also take care to consider whether or not our voices are taking up space that could be granted to writers of color who have not had the same opportunities to speak or to publish. The realities of the marketplace and the attention span of the modern human dictate that this is a genuine possibility. But to stop short of trying because of these risks handicaps us all. The default flow of information, attention, experiences, and imagery might be in the direction of white people like myself—we the loud, obnoxious, blundering, self-absorbed, self-centered sibling of the US family, we who have historically been the referent. Thanks to demographics, this will not always be the case. But in the meantime, with intentionality, I believe this myopic vision amongst wypipo can be remedied. It takes exposure, dialogue, travel, reading, watching, and most of all, shutting up and listening. In that spirit, I think that is enough from me. People who look like me have had the spotlight on them and the microphone clutched in their hands a long time. Acknowledging that requires me to step aside, to let the characters take the stage—in this case Jamhuri, Latia, Njambi, Anastasia, and Esmeralda, who all have their own real-life counterparts—so they might tell their stories. I’ll be off to the side, sitting down and shutting up. Thanks for reading. Hope you enjoy. If you don’t, well, I’ll try to do better next time. This even happens in social activism. One need look no further than the initial confusion about the origin of the “MeToo” campaign. Many Twitter followers attributed it to Alyssa Milano, when it was actually a campaign started in 2007 by Tarana Burke, a Harlem activist, as a way to support women and girls and women of color who had been victims of sexual abuse.